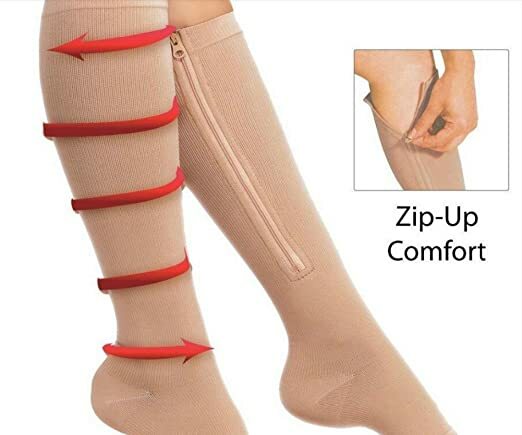 Premium Zipper Compression Socks reduces leg pain and tiredness through carefully engineered graduated compression. They are designed to help people suffering from any of the following conditions: Tired Legs (Leg Fatigue), Aching Feet, Swollen Ankles, Varicose Veins, Lymphedema and Sore Muscles. They are tighter at the bottom (foot and ankle) and looser at the top, preventing them from cutting off circulation rather than helping it. Open-toe design allows Your feet to breathe and avoids the feeling of constriction. Soft, comfortable, easy to put on and lightweight.